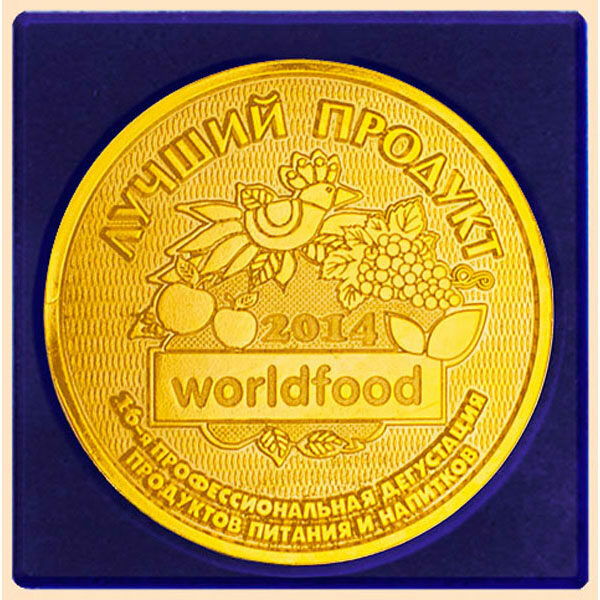 The International Competition «The Best Product-2018» was held at the 25th international food exhibition «PRODEXPO – 2018» in Moscow city. 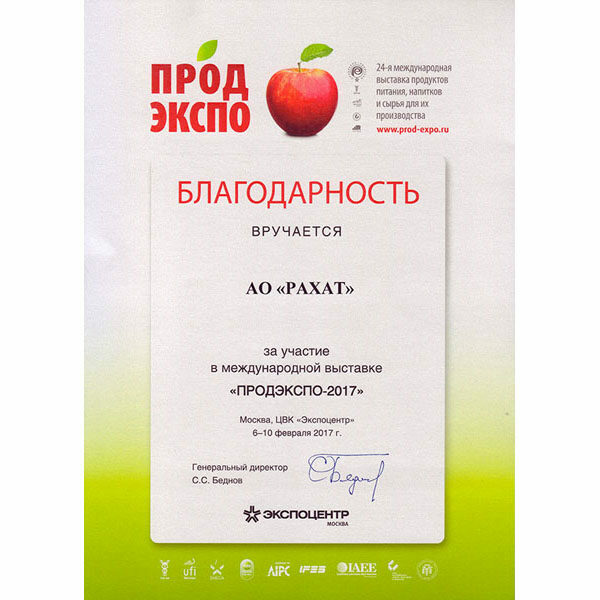 “Rakhat” JSC participated in the 24th in the largest international exhibition of food and beverages “Prodexpo 2017” in Moscow city. 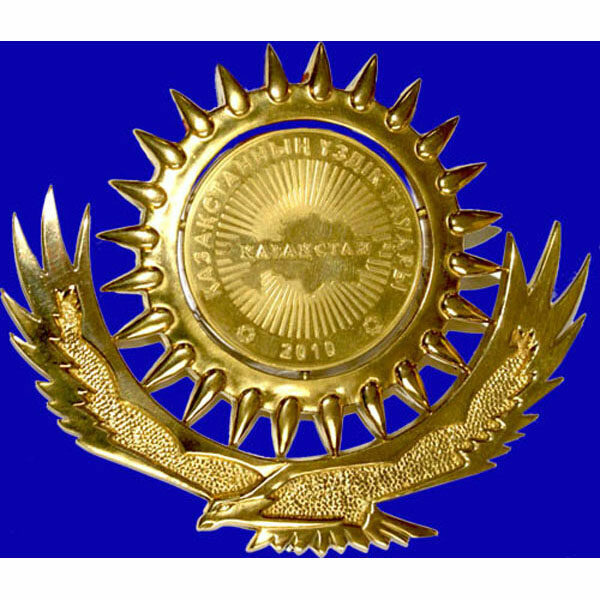 Akim of Almaty city Bauyrzhan Baibek presented a certificate of gratitude “Rakhat” JSC for contribution to the organization and holding of the 28th World Winter Universiade – 2017! 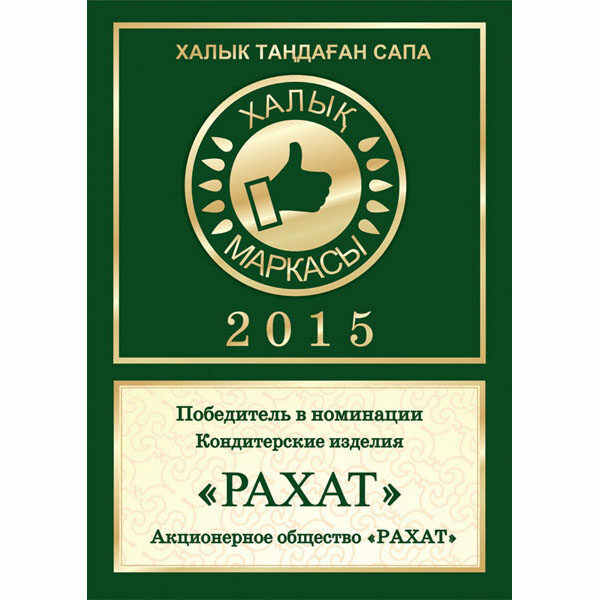 JSC “Rakhat” took part in a national competition of consumer acceptance “Halyk Markasy”. 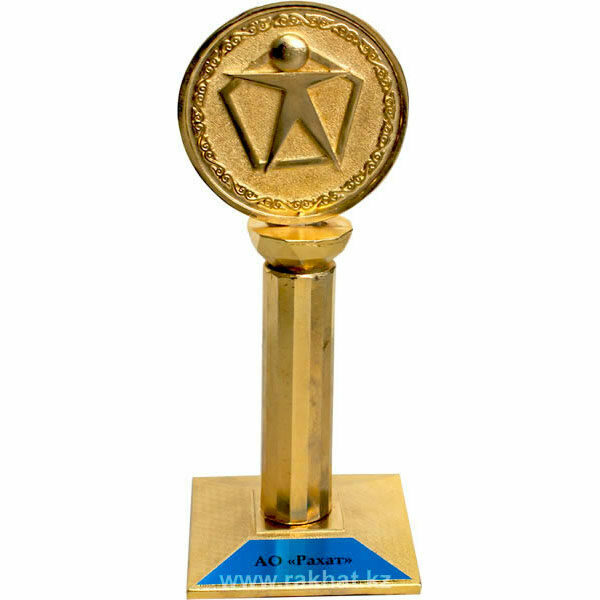 At the end of the contest the trademark “Rakhat” obtained the largest number of votes and officially became the winner in the “Confectionery” category. 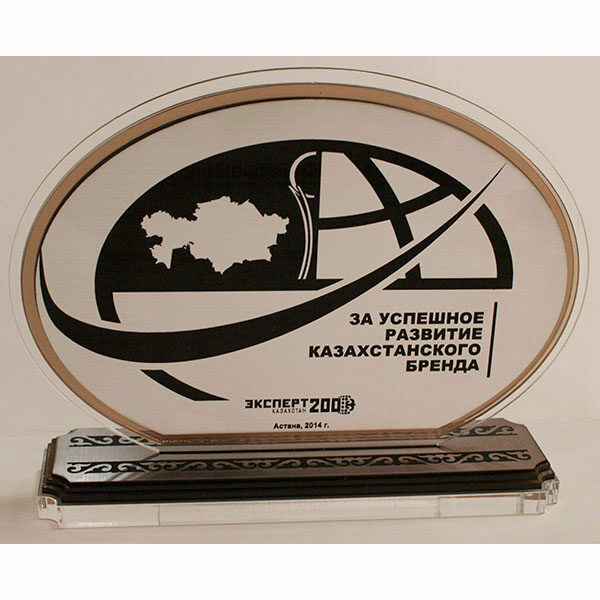 According to the results of the regional contest “Best Product of Kazakhstan” JSC “Rakhat” took 1st place in the category “Best food products”. 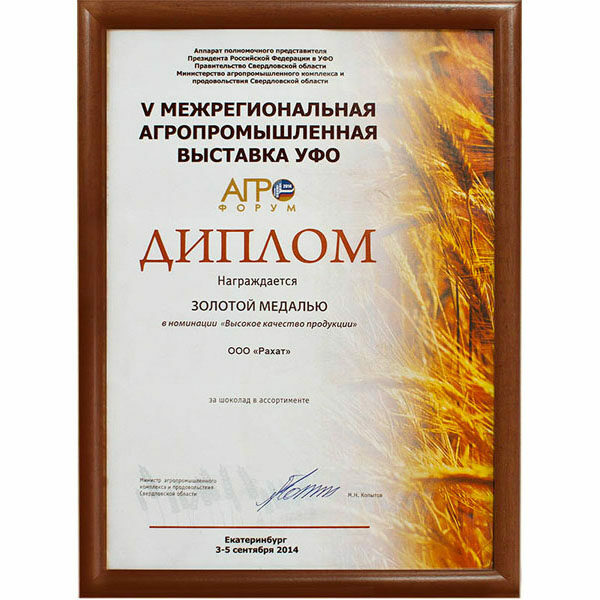 Rakhat JSC received a gold medal at the inter-regional agro-industrial exhibition “Agroforum 2014”, held in Yekaterinburg. 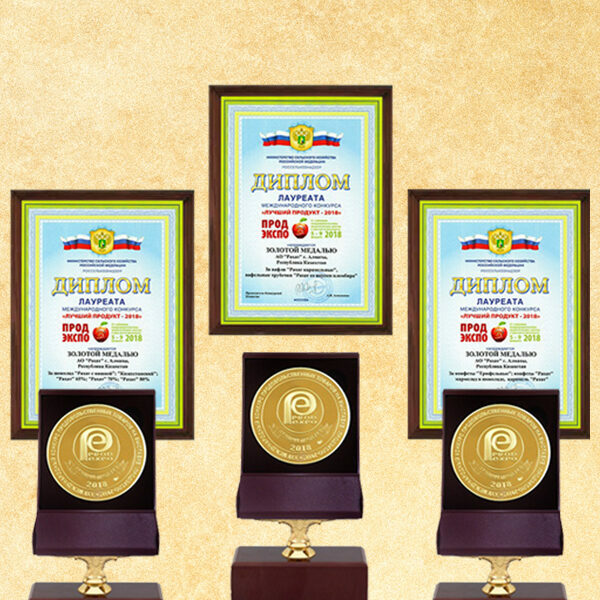 Based on the results of the national business rating Rakhat JSC is recognized as the leader among large enterprises engaged in the production of cocoa, chocolate and sugar confectionery in the Republic of Kazakhstan. 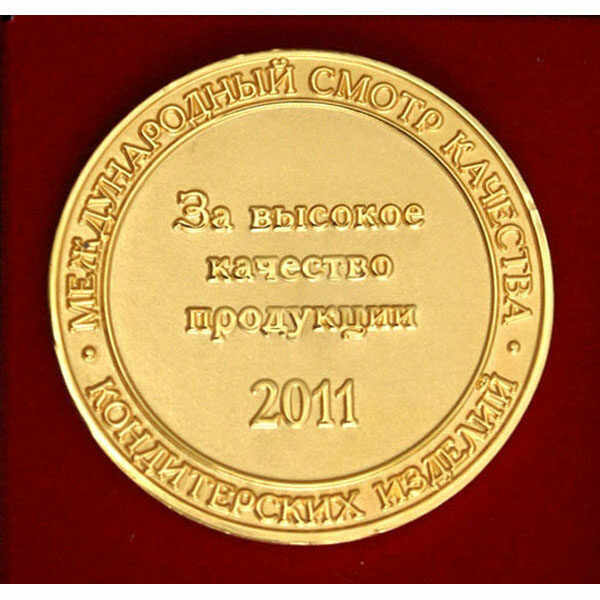 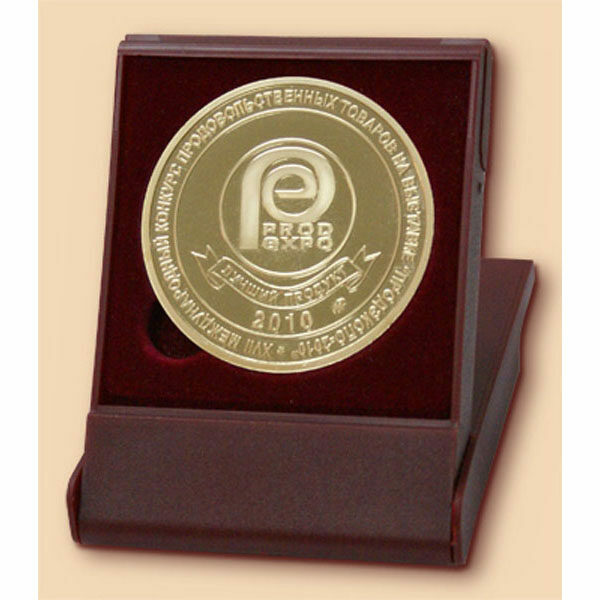 The title of the “Leader” is confirmed by the relevant up-market Honor Badges, such as the official National Certificate “Industry Leader 2014” and the campaign medal “Sala Koshbasshysy 2014 (Industry Leader 2014)”. 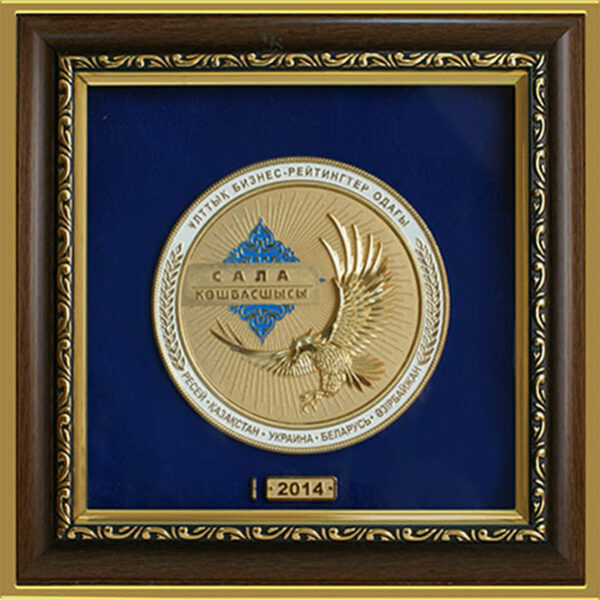 The National Business Rating is a comprehensive rating project, which has been effective since 2002, and widely known in the CIS and the Customs Union as a leading nation-wide not-for-profit rating for assessment of the effectiveness of an enterprise. 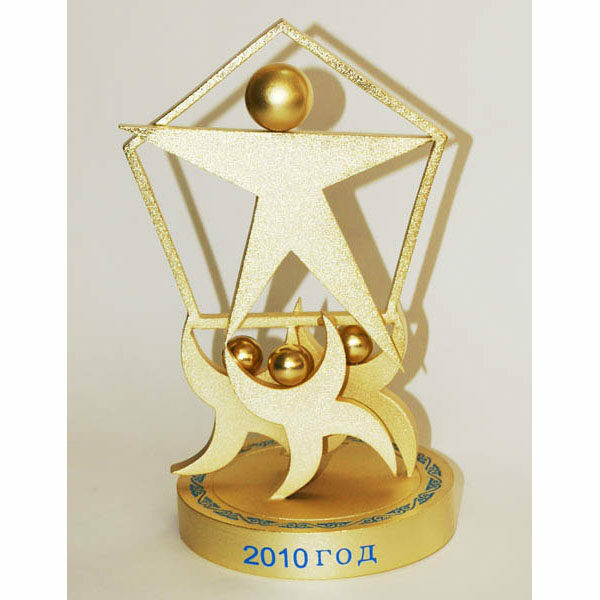 Rakhat JSC occupied the 2nd place in the Republic of Kazakhstan in three categories: “Assets and Liabilities Indicators”, “Profitability Indicators” and “Liquidity indicators”. 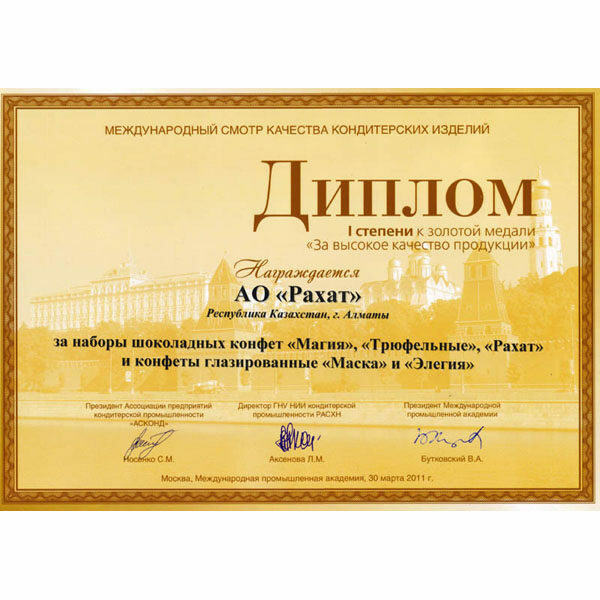 Products of the company have been awarded with the certificate and national mark of quality “Bezuprechno” (“Irreproachable”). 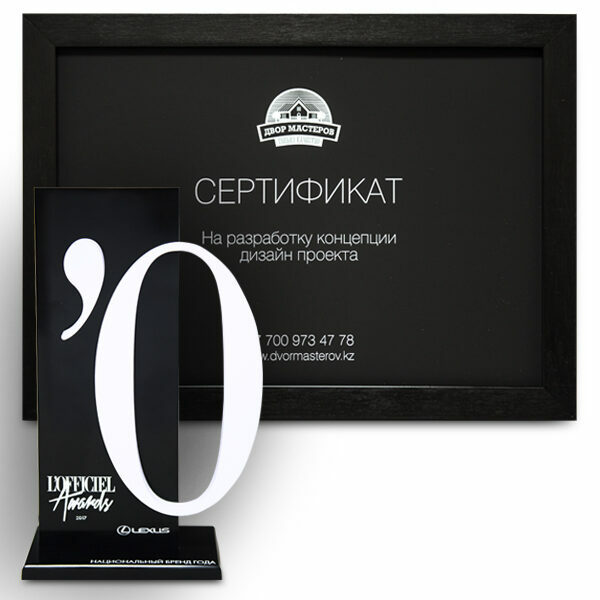 Products of the company obtained the certificate and were awarded with the “Irreproachably”, the national mark of quality. 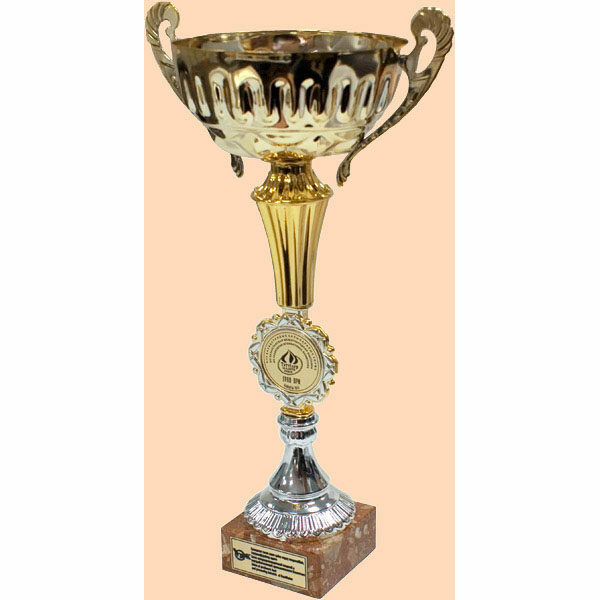 Grand Prize in the “Choice of the people” consumer degustation Diploma of competitor in the “Choice of the people” consumer degustation. 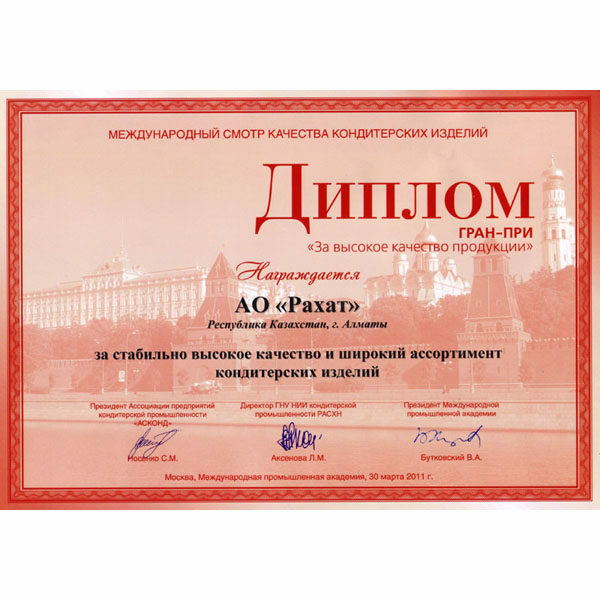 The 8th international conference “Confectionery products of the XXI century” was held at the International Industrial Academy. 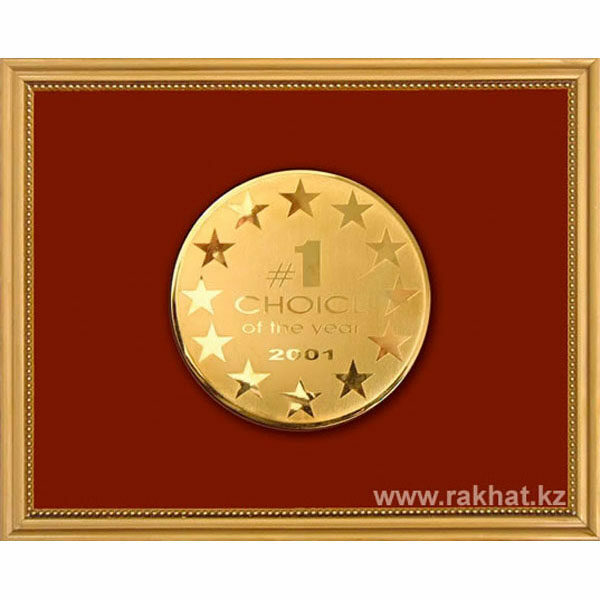 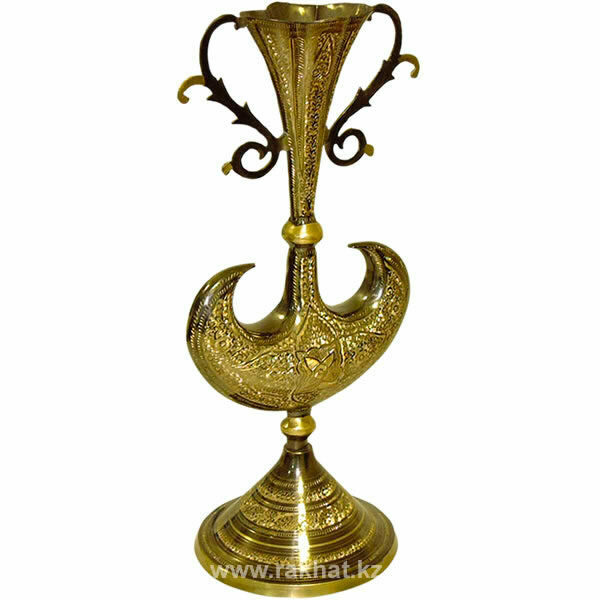 8 items of products of Rakhat JSC received gold medals “For high quality of products”. 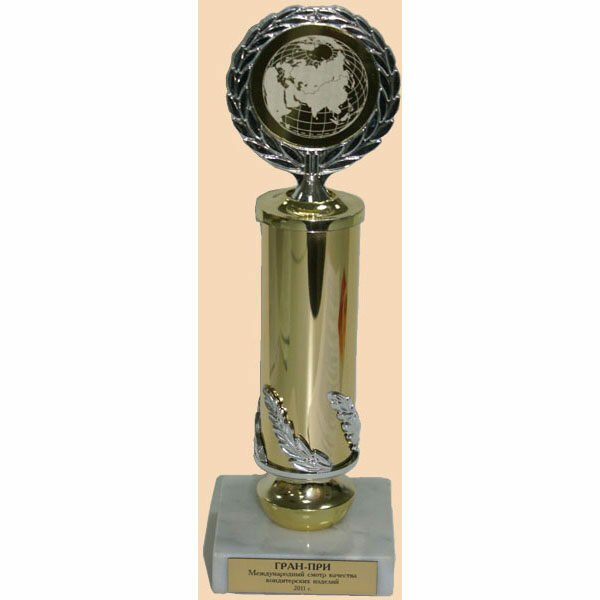 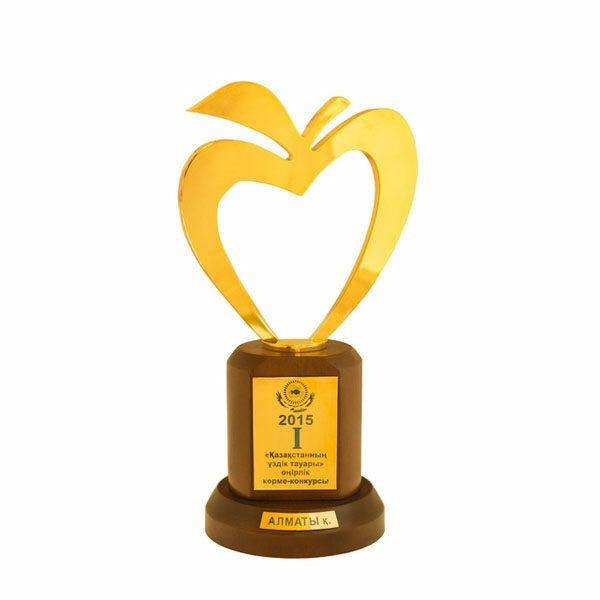 Per totality of competitive results and constant work in the field of improving the consumer properties of confectionery products, the RAKHAT joint-stock company itself won the Grand Prize “For High Quality of Product”. 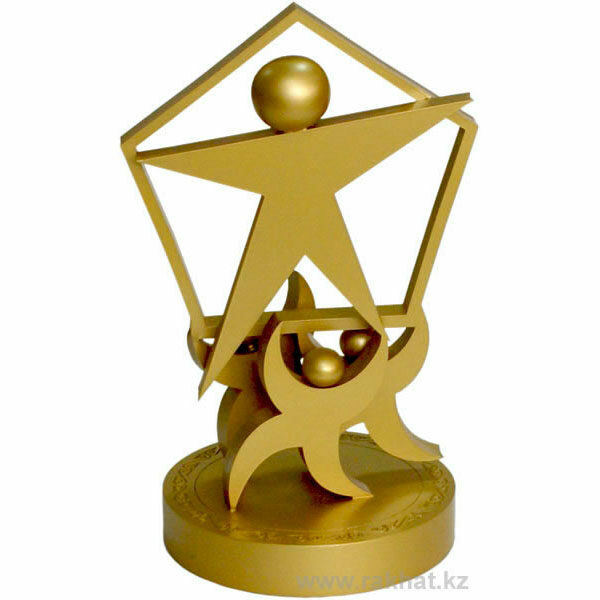 Company won the first place at the “Best Goods of Kazakhstan” republican competition in the “Best food products” nomination. 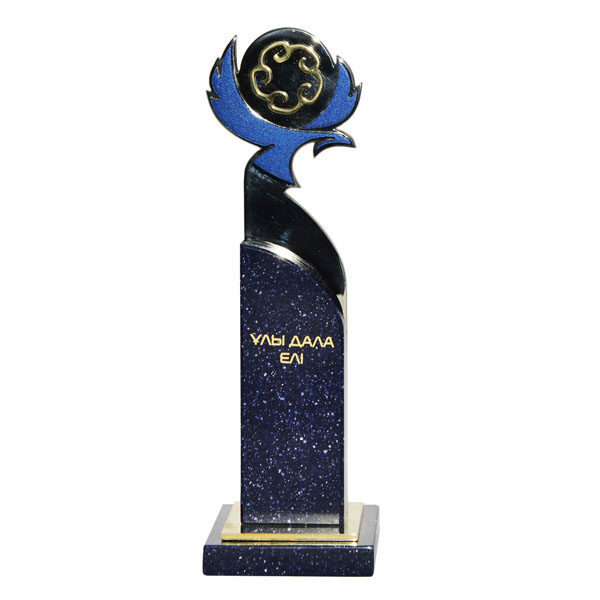 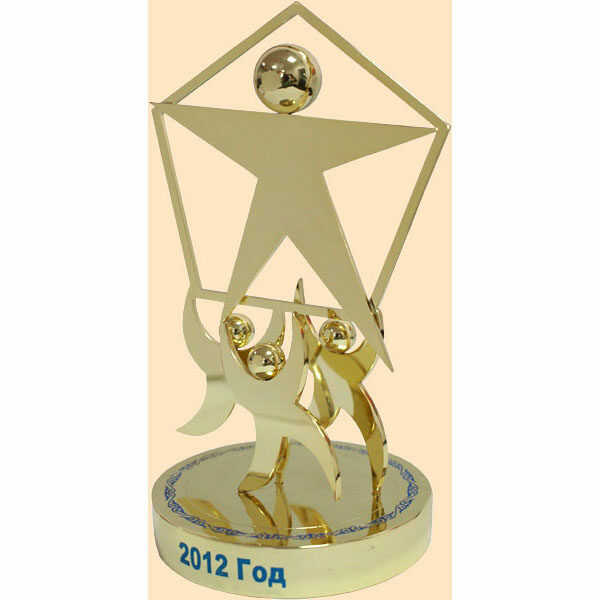 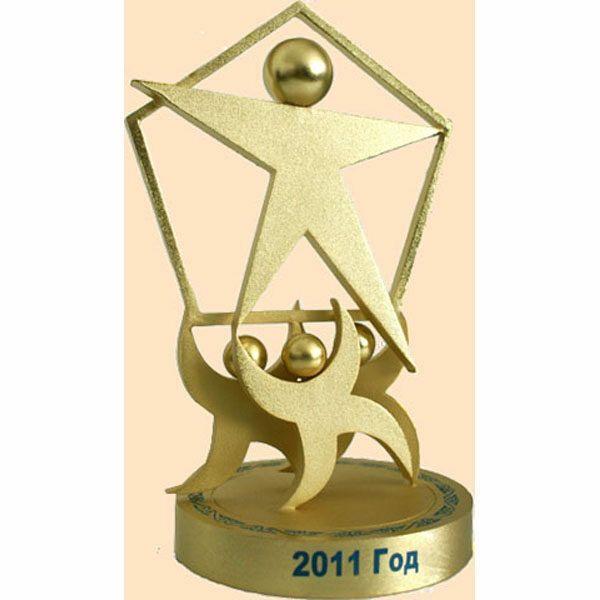 The products of company were awarded with diploma and gold medal in the “Best product 2010” competition on the ProdExpo 2010 exhibition in Moscow. 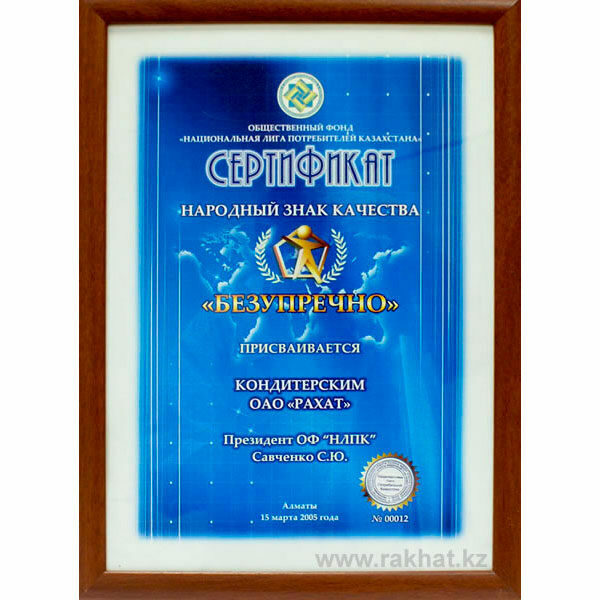 2001 Awarding the honorary title “Best taxpayer of the year” and the gratuity sign of the Ministry of the state finances of Republic of Kazakhstan for “Rakhat” JSC.